We are in the Winthrop Shopping Plaza (intersection of Bloomingdale and Providence), building 6037 Winthrop Commerce Ave STE 225, the same floor as RIVERVIEW FAMILY MEDICAL and several other small offices. Look for our pink “POLE FITNESS” sign from the outside on the second floor, park in front of it, and take the stairs by Yellow Fin Realty under the archway to our floor. We have a colorful curtain and a small private hall, you will see our door and suite number down it. 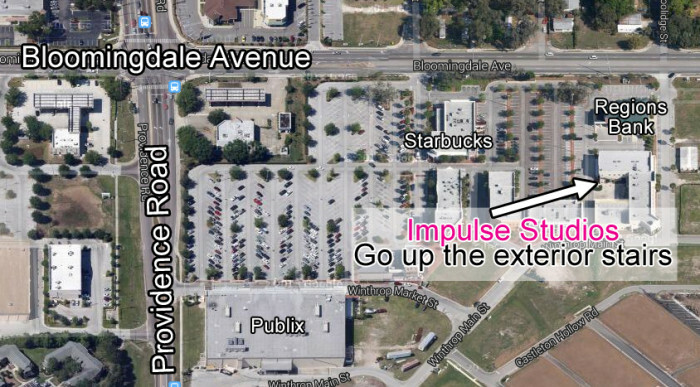 From Starbucks in Winthrop, go away from Publix towards the TIMES building and Regions Bank parking lot, our building is facing you, white with arches on the bottom, we are on the second floor. We love our privacy and unique studio space in this building, but it can be confusing at first to locate us so please allow extra time on your first visit. We also put a sign out on the ground floor to help you locate us. We are available for studio tours and face to face info by appointment. Please contact us to set up a day and time that is best for you. We are available by phone at 813-325-1990 and return messages within 24 hrs. if we miss your call. Your call is very important to us, please leave a message, we will call you back no matter what!